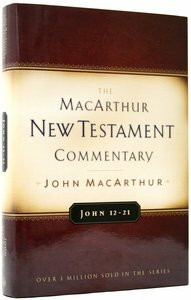 John 12-21 completes The MacArthur New Testament Commentary's coverage of this important book of the New Testament. This is a verse by verse and phrase by phrase treatment of the text. The cultural and theological contexts of each passage are brought to bear on the interpretation of the text. Where relevant, the Old Testament is used to explain the passage, and controversy is never avoided. The fact that the new believer is often directed to study the gospel of John, and the mature believer never forsakes its study, gives this book special value. About "John 12-21 (Macarthur New Testament Commentary Series)"
Completing his masterful verse-by-verse commentary of John, MacArthur's simple exposition and penetrating insight highlight the Gospel's cultural and theological contexts. From one of today's top-selling commentary series comes volume&nbsp;two of the Gospel of John. John MacArthur gives verse-by-verse analysis in context and provides points of application for passages, illuminating the biblical text in practical and relevant ways. The series has been praised for its accessibility to lay leaders, and is a must-have for every pastor's library.